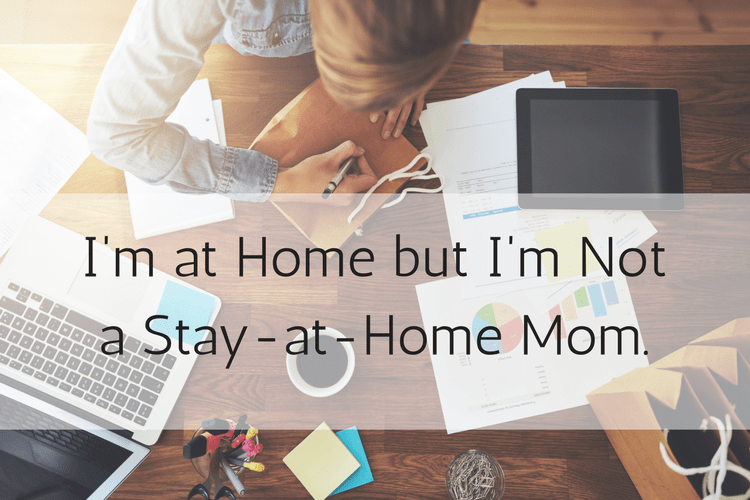 I’ve never really been comfortable with the term Stay at Home Mom. Mostly because I’ve never really been a stay at home mom. After Jack was born I went back to work and then I cut my hours down to 2 days a week and shared a position with another mom at work. Then when she came back full time I worked on special projects until a position became available in another office and I worked 2 days a week at that office and eventually upped it to work a few days from home and in the office up until about a week before I had Grace. I always had a job outside the home until Grace was born and I opted not to go back to work. The commute was too far with a newborn and the company was in the process of being sold, which was more unpredictability than I wanted to deal with. But I always lived in this gray area of being at home but also working. Back in July, I got a job that is completely work-from-home. No office to drive to, no getting dressed up, no leaving work at work. Recently that job became full time. Which is a completely positive thing and I never thought I would be this lucky to get a job I love, at a company I love, that allows me to be at home. The only catch is, I’m not really at home I’m at work. So when my friends who are at home ask me to get coffee, I’m usually trying to schedule it in between meetings and school pick up. And sometimes when I agree to go to a playdate I’m watching the clock or checking my email to make sure no one is looking for me. And being at home all day has its assumptions. That I’m not doing anything. Or that I “don’t really have a job”. Or that I’m at home so of course, I can do x, y, and z. But while I may be sitting at my kitchen table drinking coffee all day, I’m actually working. And even though I’m in sweatpants and throwing in a load of laundry I’m doing it in between a conference calls and on a deadline. Working from home brings some flexibility. Some days I can grab that cup of coffee or meet up for a morning walk. But most days I’m just frantically finding time to do all the things I should be doing at home in between all the work I am doing at home. When I tell people I work from home. I think they think it means that I’m strolling into Starbucks at 11 with my laptop. Or that I’m taking a conference call from the beach. I’ve been to Starbucks once if you’ve ever tried taking a conference call in a Starbucks you will understand and I’ve yet to work from the beach. So while it looks like I’m home these days, I’m actually at work. But I’m really hoping to fit that coffee into my schedule soon. I love this! My stepdaughter always assumes that I’m just surfing the web when I’m actually working! Most people don’t get it. Thank you! My son always thinks that I’m not working because I’m at home. I am in a similar situation. I am a photographer and blogger.. I spend my days in front of a laptop at home or behind a camera.. while also doing all the house related chores.. But because I am self employed my situation seems even less serious and important to most people. That is definitely it, people seem to take it less seriously because you are self-employed and at home so how can you really be working. I definitely relate to that.